Oh, MIchael, you may not dig the hairy forearm look, but I'm totally crushing on your hairy / fur backpack for Fall 2016. Talk about "Love at First Sight" !!! Even though this backpack is plastered all over MK's website, I can't find it for sale anywhere. NOT that I would ever be able to afford it. The closest thing I can find is a black shearling version at Saks for $798. Yes, people have that much $$$ to blow on a backpack. My mission is to create my own version which, admittedly, is whole lot more fun. Plus, this will be my first foray into bag making. I started collecting the materials for this project at Peter's MPB Winter Frolic back in March. (I'm hoping for a repeat in 2017!). 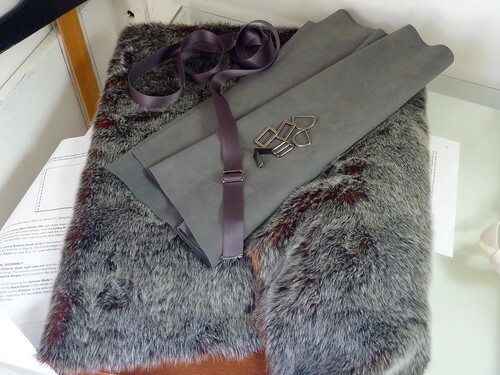 I purchased a half yard of faux fur at NY Elegant on W 40th St. They have a huge selection of furry delights up in the mezzanine. Their inventory truly runs from the sublime to the downright ridiculous. Don't, however, expect to find any "bargains" here. Sometimes a splurge is in order. And somehow, having so many furs to choose from can justify the price of admission. 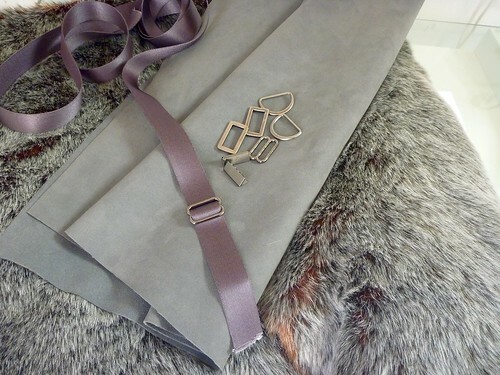 I fell hard for this silver tipped number with a rust undercolor that's revealed when the fabric folds. I wish you could feel how deliciously soft it is. Yummy! I've gradually been collecting the other bits and pieces I'll need. I'm going to substitute gray ultrasuede for the leather portions of the MK bag. The webbing is actually a better match than it appears in these photos. Trust me, it's not lavender! I still need to get a grommet kit and 3/8" grommets. I'm also reconsidering some of my hardware choices. There are lots of options out there! Swivel clips, D rings and slides, Oh MY! I've also hit JoAnn's for some interfacing and stiffening products I'm not familiar with. Pellon Shapeflex (which is a fusible stiffener for the back and bottom), and Pellon Thermolam (a fleecy fusible that I'll pad the lining with). If anyone has experience with these please chime in! I looked around on the Internet and Etsy and settled on this pattern. The Lucy backpack from Swoon Sewing Patterns. It has the overall shape of the MK, a drawstring top with grommets and a good sized flap. It has some features I don't like, but those are easy to omit. I'll configure the inside to suit my needs. Basically, a padded pocket to hold my iPad, one small zippered compartment and other open pockets for pens, checkbook, fabric swatches etc. I picked up a remnant of upholstery tapestry for $2 at Goodwill and banged out a rough "muslin". The directions were well illustrated and very easy to follow. Kudos to Swoon! I poked holes in the top band to simulate grommets and threaded some SnugHug through to get the gist of the drawstring. It really helps me to work through all this in advance, especially since I've deviated from the pattern in places. This is just some twill tape to simulate the straps. Overall, I think I'm off to a good start. The bag may be just a touch on the small side, so I may lengthen it by an inch or two. The next step is to research how to work with faux fur. I hear I'll need a good vacuum cleaner! My sewing and blogging has really taken a backseat to the boat this summer. I'm really wanting to have the whole project wrapped up before the snow flies, but there are days when I have my doubts. Recently I've been making the spars (mast, boom, gaff and jib club). Basically, planing and sanding square stock into round parts. I'm pleased with the results, but can't honestly say that any of it has been fun.